High Park has a lot of cherry trees. They bloom for such a short time and it’s hard to predict when peak bloom will be, so it can be difficult to organize a get-together with friends. The park is just a few minutes away by bike, though, so it would be a shame to miss it. This year I guiltlessly went on my own to see the cherry blossoms, enjoy the brief spectacle, and marvel at how busy the park is during those few days. 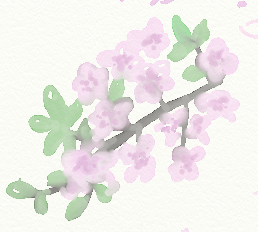 I like the delicacy of watercolours, but have never quite gotten the hang of doing them with actual water. I fuss about with water and paints, and then I end up with this brownish-grey mess that doesn’t look anywhere near what I wanted. 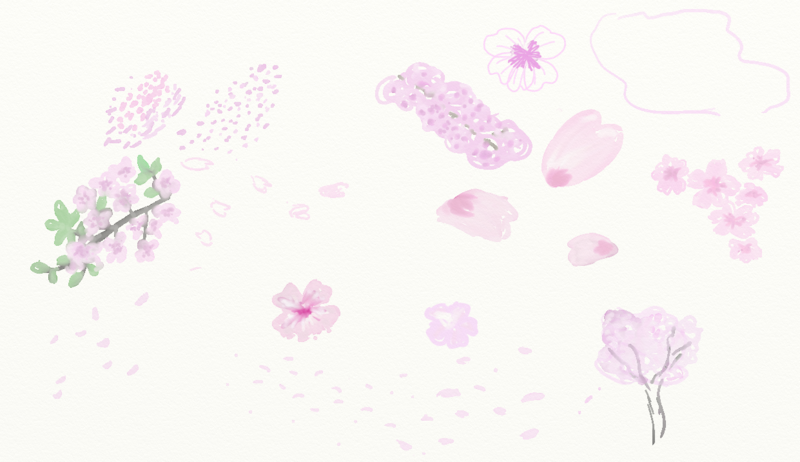 Drawing on my tablet PC is helping me learn to enjoy drawing, so maybe my tablet PC can also help me learn to enjoy painting. Maybe I can send my friends and family digital hand-painted letters, and then eventually move to doing them on paper… Or as print-outs, but that would be cheating, wouldn’t it?